It was just few weeks back that 'Baywatch' makers released its first poster, it created a lot of chaos as Indian beauty Priyanka Chopra was missing from it. But now we have the new July poster in which Priyanka looks 'Smoking Hot'. Finally after the wait, Priyanka shared the new poster on her Instagram account and captioned it saying, "Finally.. We're all in one frame! Ain't no party like a beach party! 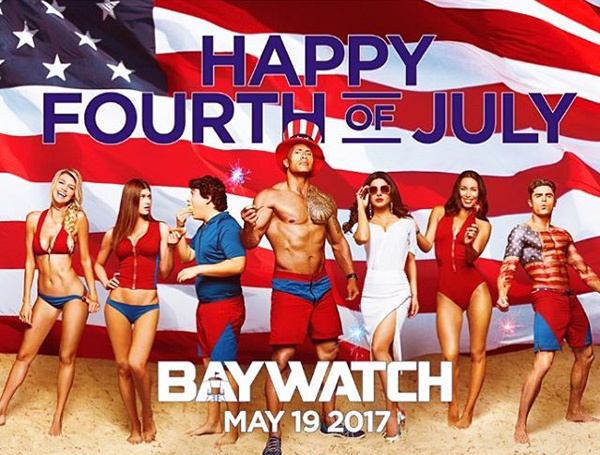 #HappyFourthOfJuly #Baywatch @therock @zacefron @alexannadaddario @kellyrohrbach @ilfenator," In their new July 4-themed poster, the entire cast is covered in stars and stripes, while Priyanka stands out in a white dress. Director Seth Gordon seems to be all set to hit theatres by next year. This movie features Dwayne Johnson, Zac Efron, Jon Bass, Alexandra Daddario, Kelly Rohrbach, Priyanka Chopra, and Ilfenesh Hadera.